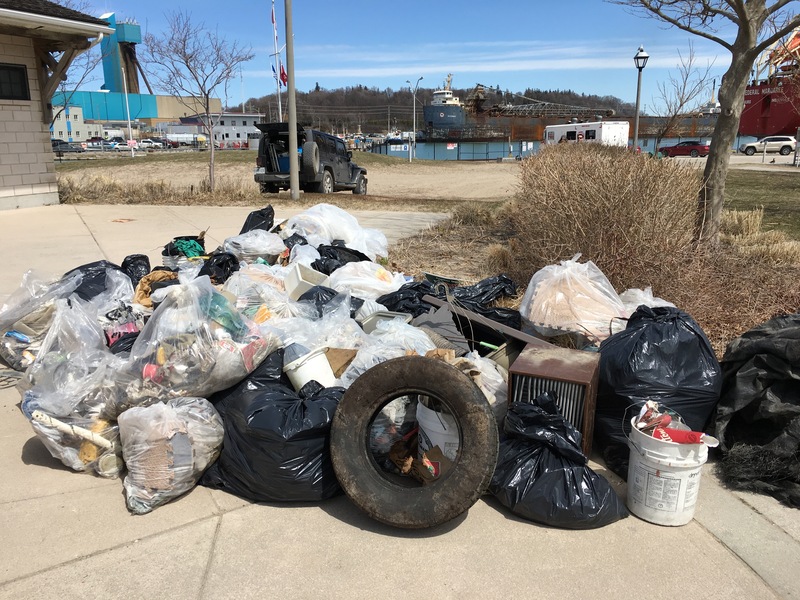 Last Saturday April 21st, we co-hosted another ‘Great Goderich Shoreline Clean Up’, with great success. 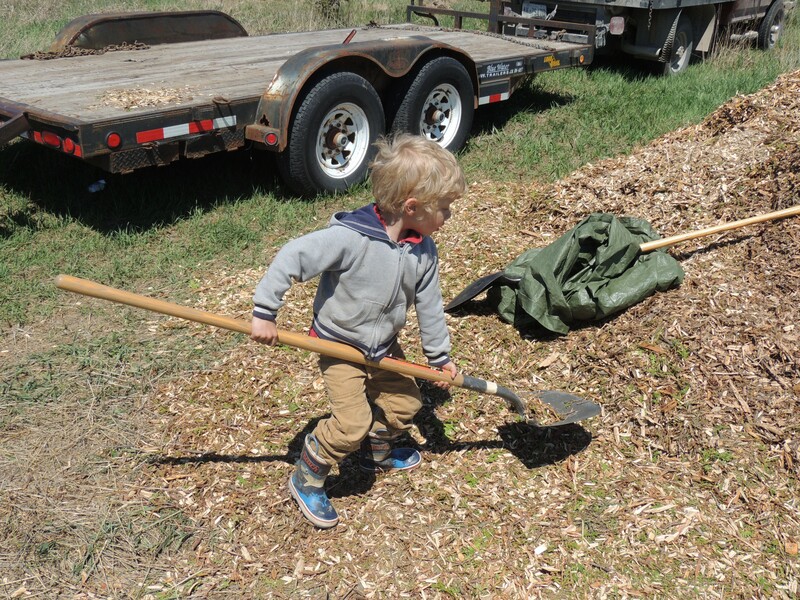 175 volunteers came together to clean up 1,072 lbs of garbage! Wow! 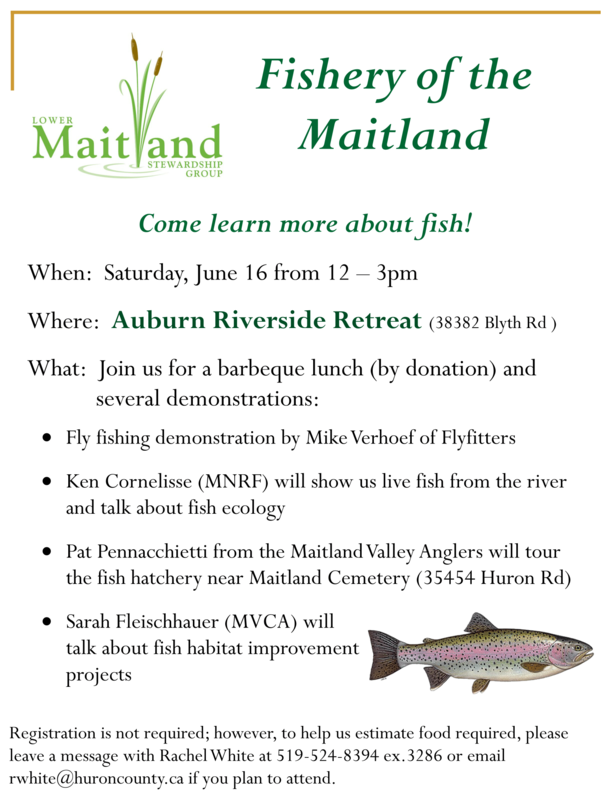 The Lower Maitland Stewardship Group and the Maitland Valley Conservation Authority lead the river clean up. There were about 35 of us, including many shoreline clean up veterans and some new volunteers. 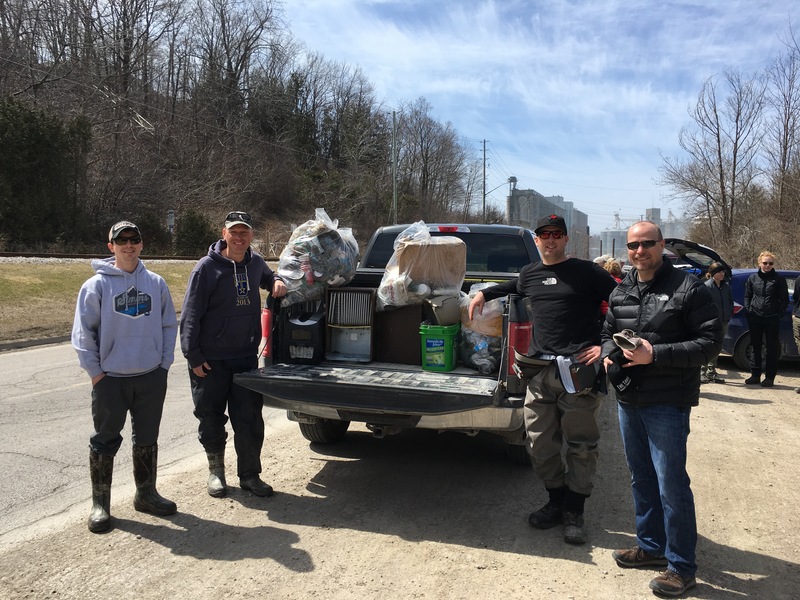 We managed to find some interesting ‘treasures’ including lots of scrap metal, a couple diapers, propane tanks, fishing tackle, a dehumidifier, and lots more. There were several car and truck loads of garbage. 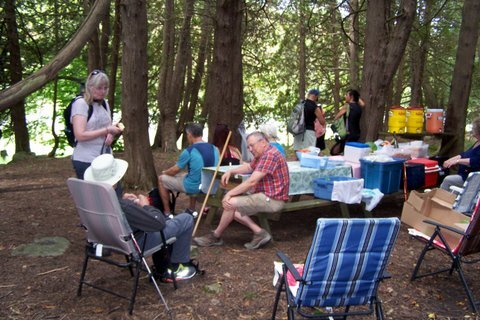 The Coastal Centre did an excellent job promoting the event, and coordinating the beach clean up and barbeque. We’re planning to collaborate on another shoreline clean up in April 2019. Thank you to everyone who helped out with the shoreline clean up! That’s a lot of garbage that’s no longer polluting our river and lake. Keen and ready to go! 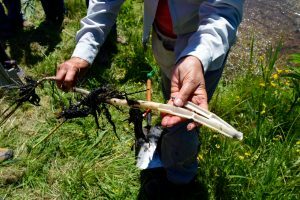 Lots of garbage was collected from several hot spots for river valley users, including trail heads and riverside parking lots. 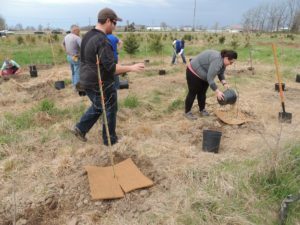 Posted in Events	| Comments Off on 1000 lbs of garbage? Oh my! 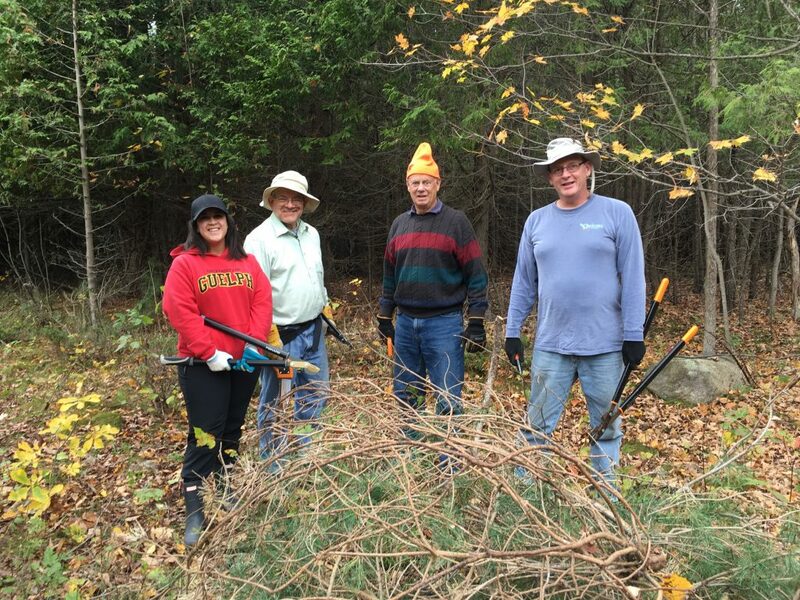 The Nature Conservancy of Canada would like to send a huge “thank you!” for helping us cut down invasive Scotch pine at the Riverbend property on October 27! 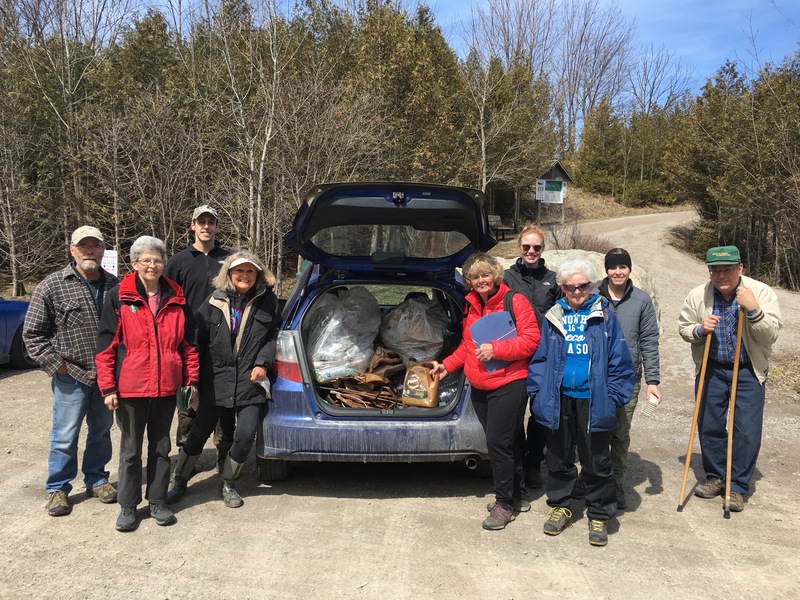 With your help our small but mighty group spent a mild fall day removing small and mid-sized Scotch pines from about 1.5 acres (0.6 ha) of forest and meadow. 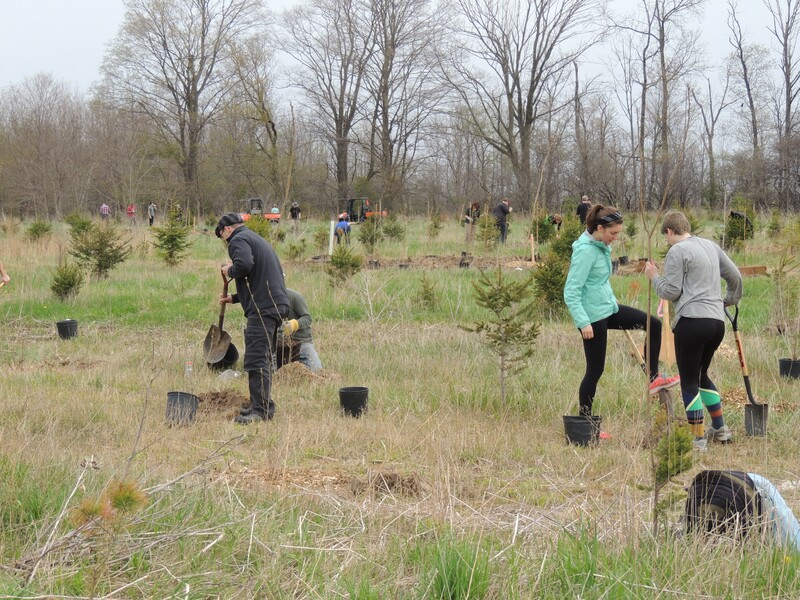 By removing these invasive trees we made space for native plants (like those scattered white pine!) 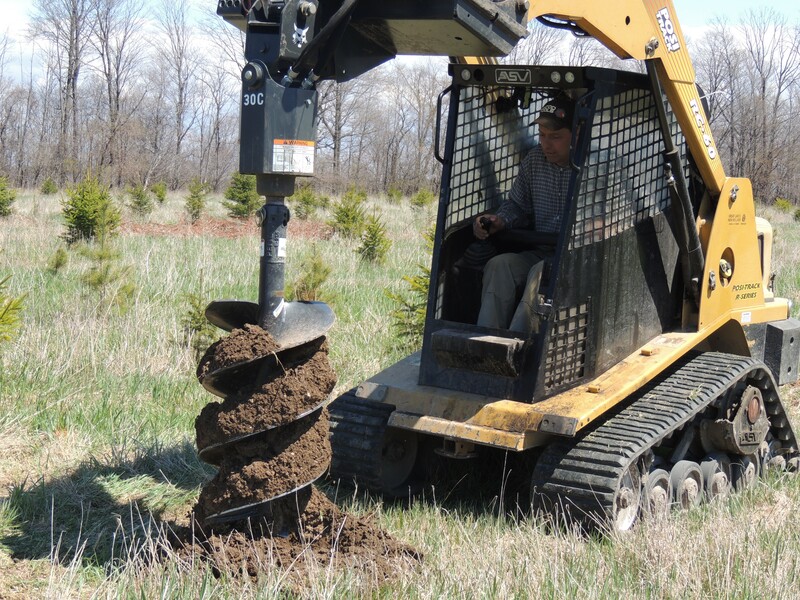 to grow, and the brush piles we built will create new habitat for birds and other wildlife. Walking through the Nature Conservancy of Canada (NCC)’s Riverbend property, visitors can see why the area is so special: a long stretch of high quality shoreline along the Maitland River; cliffs that host old, slow-growing cedars; deciduous forests containing southern species, such as common hackberry and northern spice-bush. Unfortunately, the property also hosts an unwelcome visitor: Scotch pine. Scotch pine (or, if you prefer – Scots pine) was originally brought over from Europe to help stabilize soil and reduce erosion. Unfortunately, the species was a bit too hardy, and today Scotch pine is considered an invasive species throughout eastern North America. 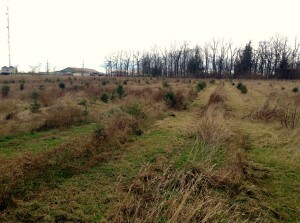 Regenerating Scotch pine fills in open areas and crowds out the native plants that should be growing there. On the Riverbend property, it has established along the trail sides and we need your help to get rid of it! 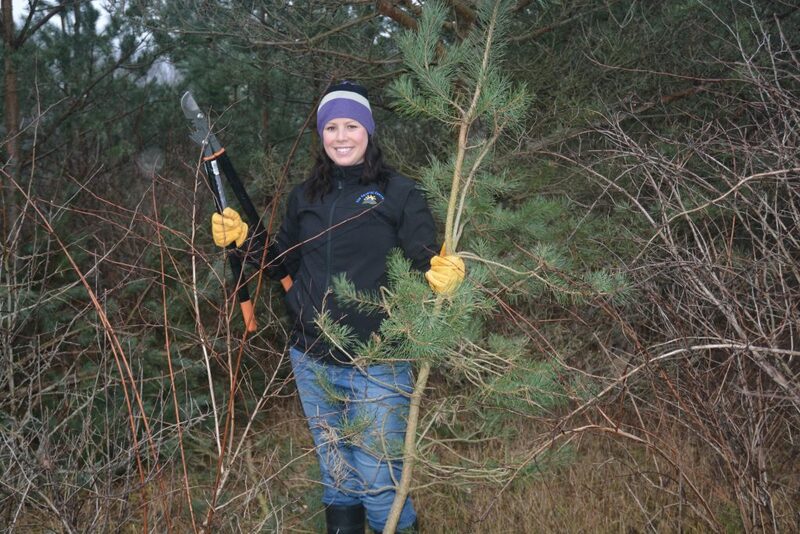 Posted in Events	| Comments Off on You’re out of line, Scotch pine! 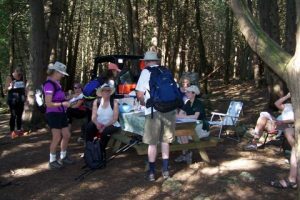 This is the fifth consecutive year that the Lower Maitland Stewardship Group has hosted the Cherrydale checkpoint for the annual Maitland Trail Association El Camino hike. The weather was sunny and hot but great, with absolutely no bugs at our location. Dan Burns loaned us his Kubota side-by-side which Tom used to deliver people and supplies to the site. We logged 150 hikers through the day and, being only 2 km from the finish, every one of them was delighted to find a place to rest with slices of watermelon, desert sweets and cold water waiting for them. Almost as exciting was the chance to use a spotless outhouse close by. We went through 9 watermelons, piles of cookies baked by the ladies of the LMSG (thanks out to Beth, Rachel, Laurie and Paula) and countless water bottle fill-ups. 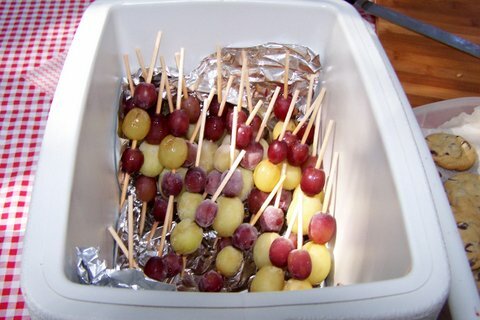 All the hikers were nuts over the watermelon and snacks but a real show stopper was Paula’s Frozen Grapes on a Stick! Thanks Tom, Cara, Paula and Wayne for helping the hikers and giving them something more to remember about their trip. 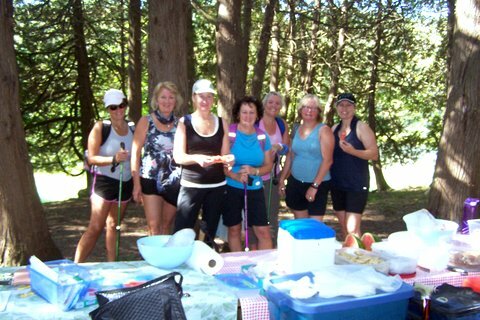 The 7 lady hikers posing for me in the group shot are hoping we post the picture on our website so “they can make a copy and have it forever!”. Lynn Short teaches about identifying Phragmites, and the spading technique. 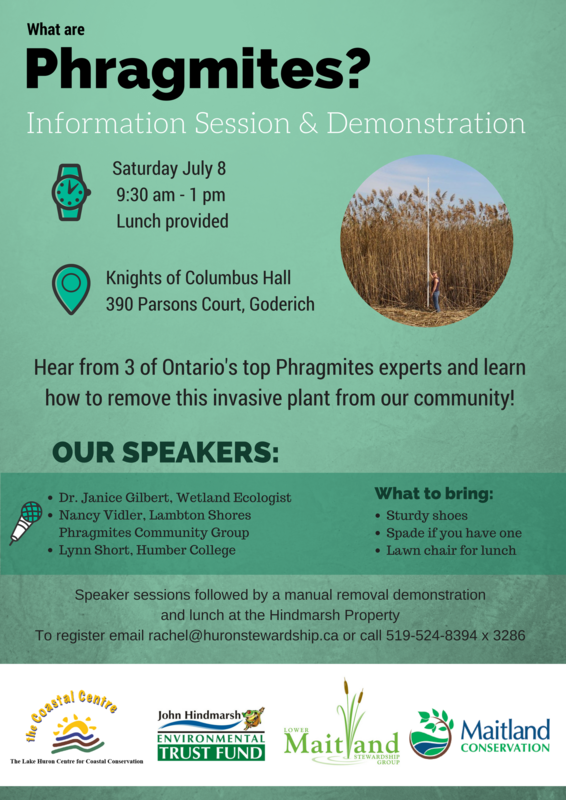 On Saturday July 8th, about 40 people gathered in Goderich to talk about Phragmites: what it is, why it’s a problem, and what we can do about it. Phragmites is Canada’s worst invasive species, and it is starting to be seen more frequently in Huron County. It is found most often where there is water – along roadsides, in agricultural drains, and in rivers and wetlands. Phragmites have an extensive root system. And they can send out REALLY long shoots! The take home messages from the day? Phragmites grows and spreads very quickly. It’s damaging our environment by displacing native plants and animals. It hurts tourism by invading beaches and rivers, and agriculture by preventing water flow. There are several ways to control Phragmites, including spading, chemical control, burning, rolling, and drowning. The best method depends on the site, and it’s likely you’ll have to work for several years to fully get rid of it. Phragmites is a BIG problem in other areas and is expensive to control if it’s well established. We need to ACT NOW to prevent it from becoming a big problem in Huron County. Working together is our best chance to get rid of this invasive plant from our community! 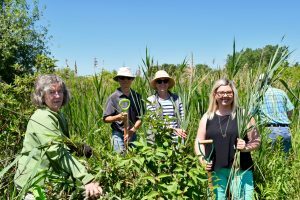 The Ausable Bayfield Conservation Authority can advise landowners on control methods for Phragmites, and are available to spray Phragmites (if that is the appropriate method) on a fee for service basis. Contact Kate Monk at 519-235-2610. Our three incredible speakers made the day a great success. 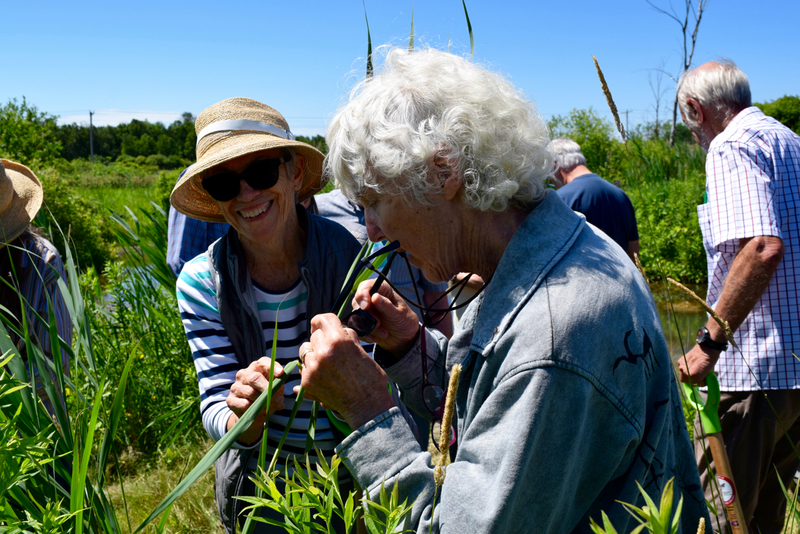 Dr. Janice Gilbert is Ontario’s leading Phragmites expert. She has done extensive research on the effect of Phragmites on Ontario’s wetland ecosystems, and has been travelling across the province to talk about why it’s important to control Phragmites and the impacts it could have if we don’t take action. Nancy Vidler is passionate and determined about mobilizing communities to remove Phragmites. 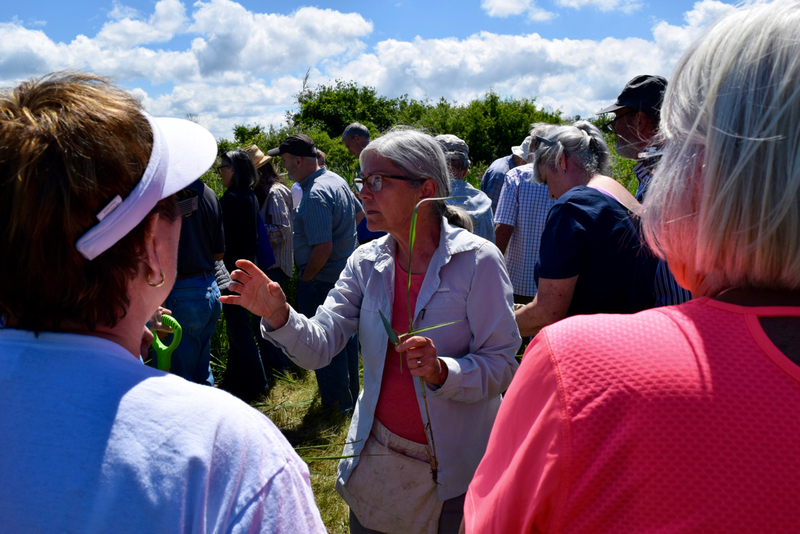 She is an active member of the Lambdon Shores Phragmites Community Group, which has done extensive work to eradicate Phrag. 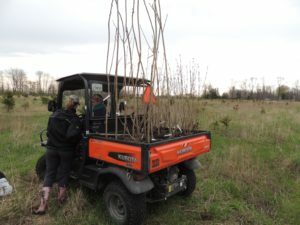 Lynn Short is a Professor at Humber College and has been removing Phragmites using a ‘spading technique’, which she demonstrated to the group at the Hindmarsh property. 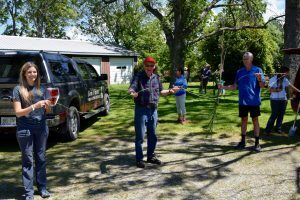 We were pleased to co-host the Phragmites information session and demonstration with the Lake Huron Centre for Coastal Conservation, and Maitland Conservation. The day would not have been possible without the support of the John Hindmarsh Environmental Trust Fund. 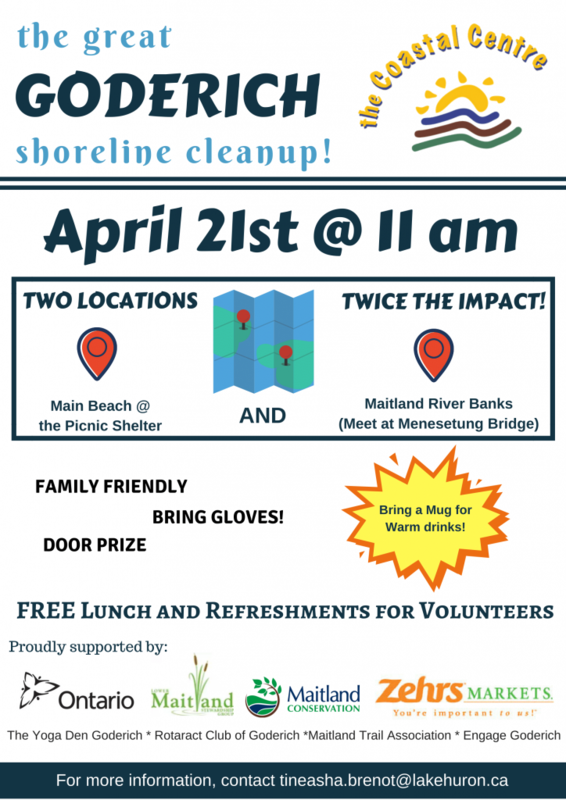 It’s no joke: Join us to clean up the shores of the Maitland on April 1st! The meeting place for the river clean up is on North Harbour Road, at the base of the Menesetung Bridge trail. See you there at 11! 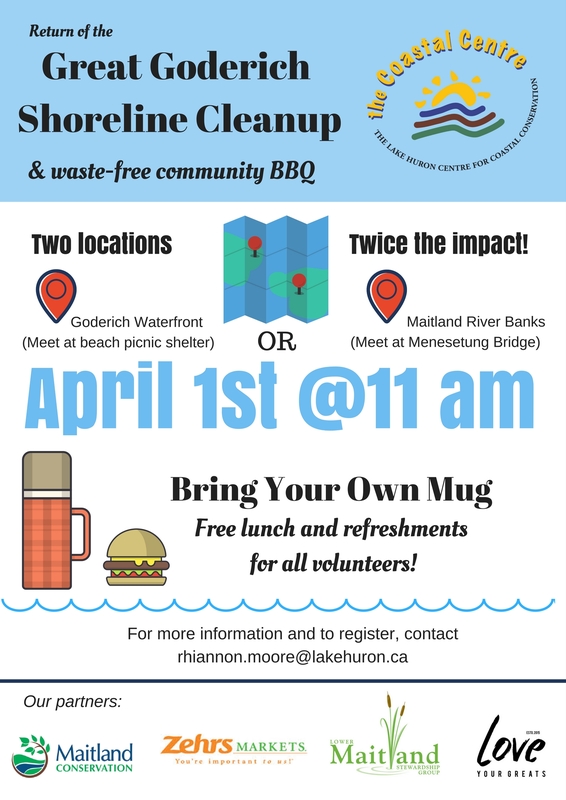 Posted in Events	| Comments Off on It’s no joke: Join us to clean up the shores of the Maitland on April 1st! Thank you to everyone who joined us to get Back to Blacker. 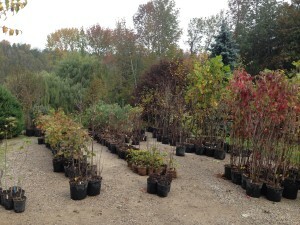 We had a little bit of rain to cool us down while we planted 400 hardwood trees. The good news was we had lots of helping hands. From people who helped prepare the site ahead of time (mowing, digging holes), to moving trees around the site, trucking in mulch, and of course getting the trees in the ground, it truly took a team effort to get everything done. 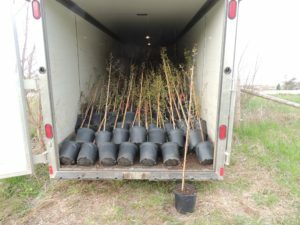 Now each of us can watch the trees grow up as we make our trips in and out of town. The trees have had a good drink of water in the rain we had last week. Thank you once again to everyone who contributed to the tree planting event. 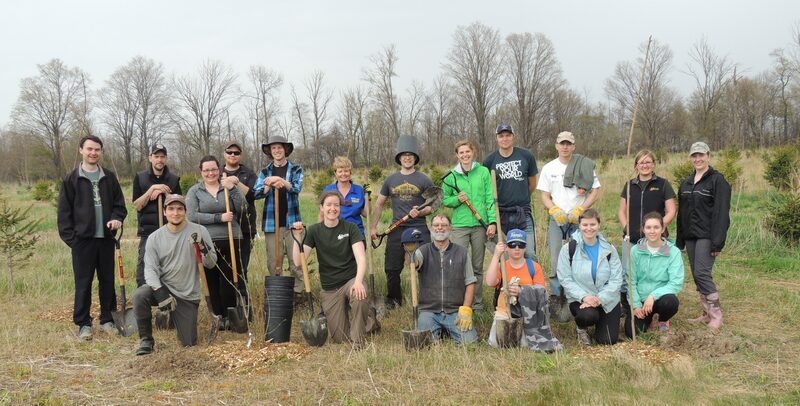 We’d also like to acknowledge the leadership and hard work of our partners at the Nature Conservancy of Canada. It’s been fun! Photos were provided by Mike Francis (NCC). Posted in Diversity, Events	| Comments Off on Back to Blacker! Where? 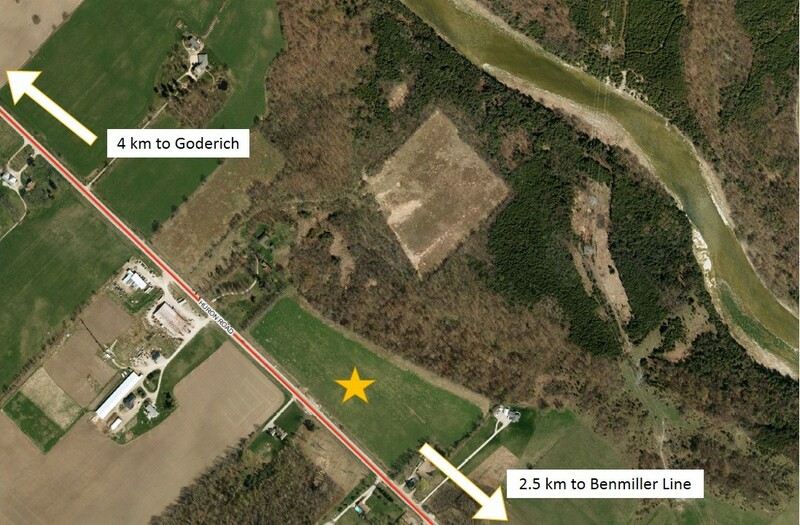 Blacker Property on Highway 8 (Huron Road), 5 km from Goderich. 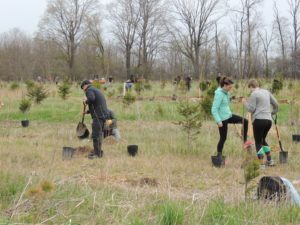 The property is owned and managed by the Nature Conservancy of Canada (NCC). 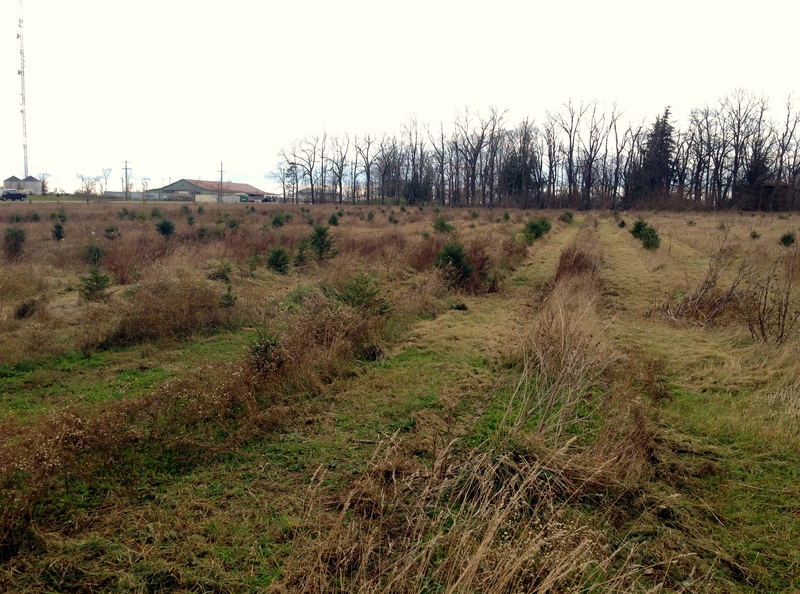 There have been coniferous (evergreen) trees planting on this property in the past, and only about half survived. 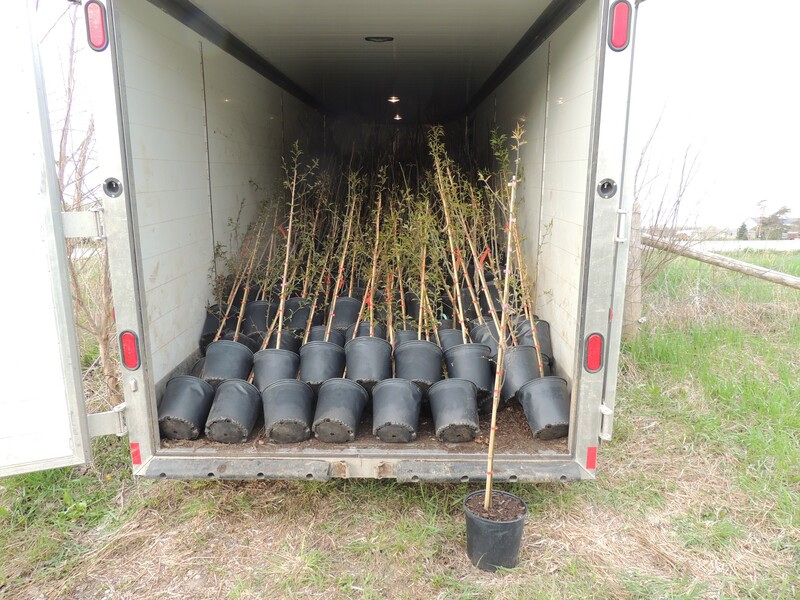 The trees planted this spring will add diversity, and eventually this area will become a beautiful mixed forest. 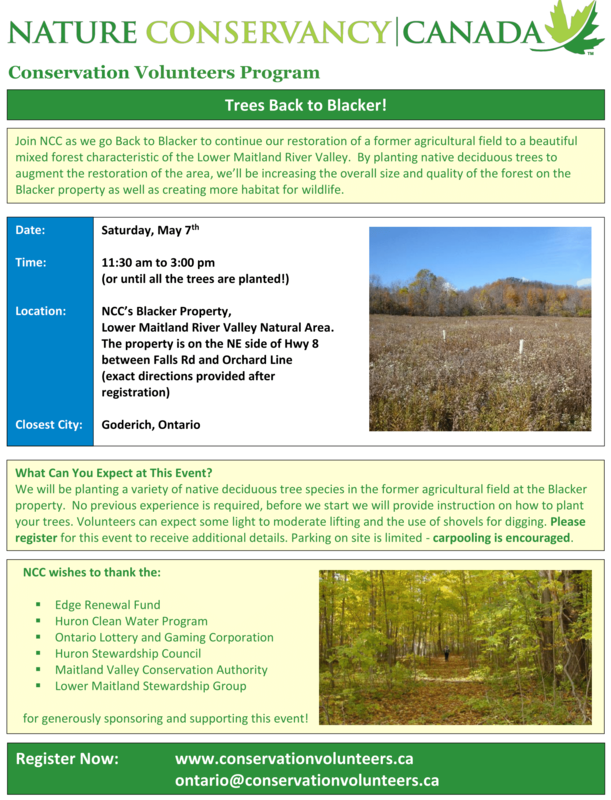 Join NCC, HSC, and Maitland Valley Conservation Authority staff on Saturday May 7th as we go ‘Back to Blacker‘ to continue our restoration of a former agricultural field to a beautiful mixed forest characteristic of the Lower Maitland River Valley. 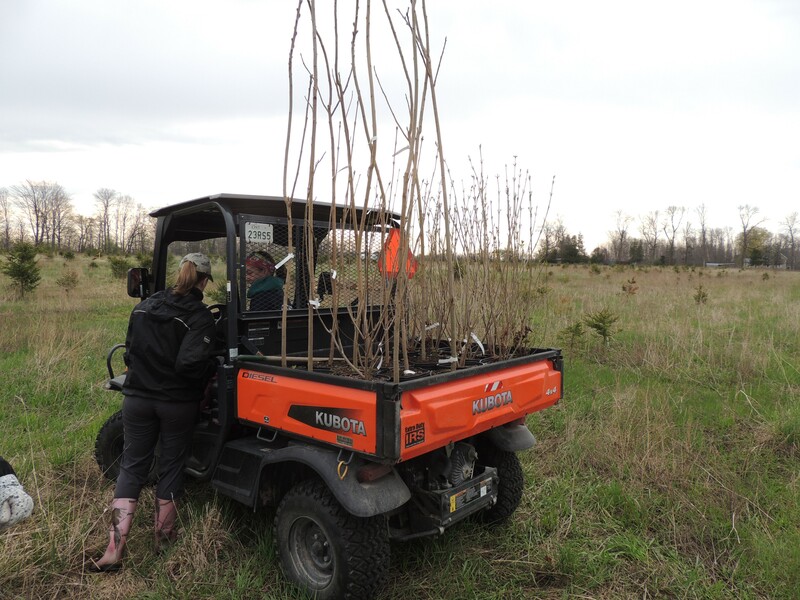 By planting native deciduous trees to augment the restoration of the area we’ll be increasing the overall size and quality of the forest on the Blacker property as well as creating more habitat for area sensitive bird species. No previous experience is required, but but participants should dress for the conditions: wear sturdy closed-toe shoes (steel toes if possible), long pants, comfortable clothing you don’t mind getting dirty, and a hat. 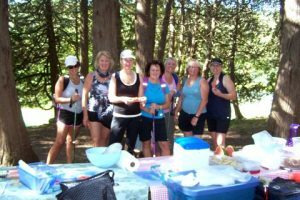 Please bring your own lunch and refillable water bottle. You may also bring your own work gloves, if you have them. NCC will provide work gloves for those who need them as well as extra snacks and water. There will be no on-site washroom facilities at this event. Additional event details, including directions and parking information will be provided after registration. We will be planting all native, deciduous species, about the size of the trees in this picture. 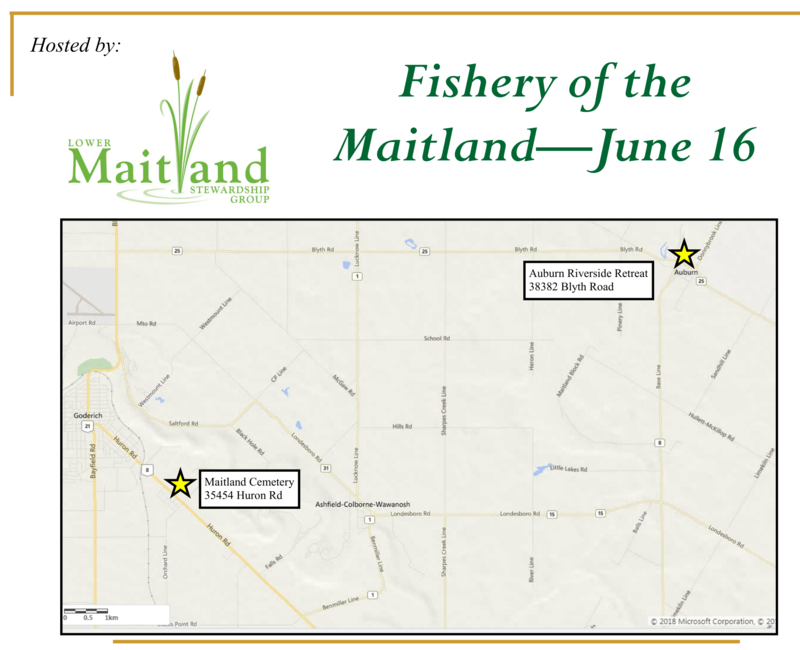 The Lower Maitland River Valley Natural Area is one of the largest areas of natural cover in southern Ontario. It is a physically diverse landscape of cliffs, forests and seepage areasproviding habitat for many species, including some of which are globally and/or provincially rare. NCC has acquired a number of properties in the area in an effort to conserve and maintain these features, including the Blacker Property. The property contains a wide range of interesting species, including the endangered butternut tree. If you’d like to carpool to the event, please click here, https://www.groupcarpool.com/t/7xipyk to add your car or join a ride going to the event. There is also a waitlist feature if there isn’t a ride there yet that works for you. Happy carpooling! NCC would like to thank the Edge Renewal Fund and Huron Clean Water Program for their generous support of this CV event. The yellow star is where the trees will be planted. There will be parking alongside Huron Road, but it will be limited. Please try to carpool if you can. We hope you can join us for our spring and summer events. The details about these events will be posted closer to the date, but for now make sure you have them marked in your calendars. June 11 – Brenda Gallagher from the Upper Thames River Conservation Authority will be leading us on a tour to learn more about the NCC’s newly acquired Riverbend property. Brenda is very knowledgeable about plants and along our route will be able to discuss plant species, their history, ecology, folklore, medicinal uses, etc. We’re fortunate she has offered to lead our outing! Posted in Events	| Comments Off on Mark your calendars!